Cities across the nation are abuzz with bike share programs. You may have even seen or heard about Portland’s BIKETOWN program that launched this summer. So, what’s the big deal? It turns out quality bike share programs can have a huge positive impact on cities. Bike sharing relies on a system of self-service bike stations. Users typically check out a bike using a membership or credit/debit card. They can then ride to their destination and park the bike in a nearby docking station. Bike share bikes are comfortable, have integrated locks and cargo baskets and usually include gearing, fenders and lights that make urban biking safe and enjoyable. Many of them are accessed by a mobile app, so you can usually find a bike nearby from wherever you are at the time. Bike sharing programs can introduce new people into bicycle commuting by providing fun, safe, and secure bikes. A 2013 study in Washington D.C. from the Transportation Research Record suggested that bike share users were different from regular cyclists. In this case, they were more likely to be women, to be younger, to have lower incomes and to be less likely to own bicycles or automobiles. According to the National Association of City Transportation Officials (NACTO), bike share programs increase the visibility of cyclists, making riding safer for everyone. Studies also show that more people riding bikes in urban areas leads to improved bicycling and walking infrastructure. Another Washington D.C. study suggested that bike share programs have a positive economic impact on commercial areas. Based on the findings, bike sharing stations attract more customers to nearby businesses and bike share users were more likely to spend money within four blocks of a bike share station. In more congested areas, like downtown centers, the bike share users spent considerably less time finding parking, and more time patronizing the nearby businesses. 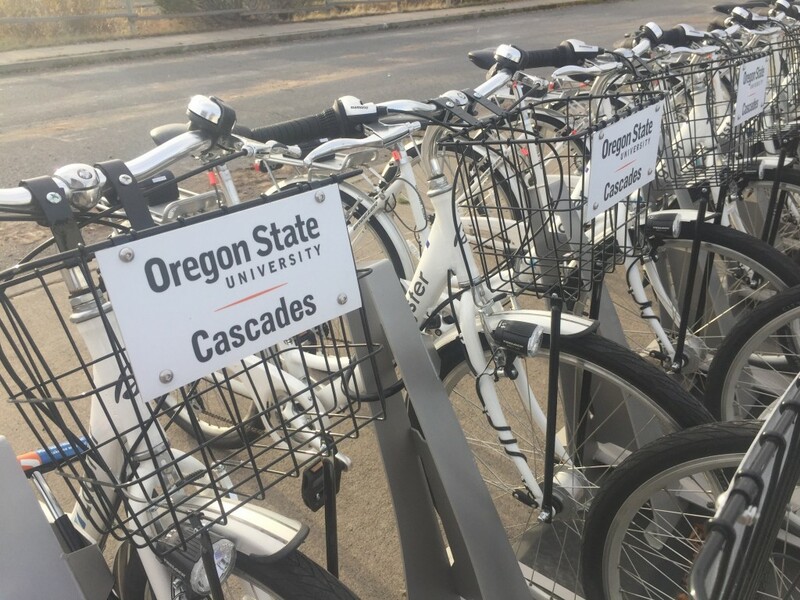 Bike sharing programs are also valuable in towns such as Bend, where we have a high influx of tourists in the summer months. It provides an easy and fun way for residents and visitors to use bikes for transportation, whether they’re shopping in the Old Mill District or following the Bend Ale Trail. Bike shares are also flexible. You can use a bike share bike for a round trip, or for one-way use. Did you carpool with a coworker to that lunch meeting, but need to stay a little longer? Grab a bike share bike and head back to the office when you are ready. “Bike sharing offers a great chance for people to choose active transportation for short trips. This is a health benefit as well. Riding a bike is good exercise, while also getting to where you need to be,” says Jeff Monson, Executive Director for Commute Options.